WASHINGTON (CN) – The federal government unsealed an indictment Thursday that charges a state-owned Chinese company with stealing trade secrets from a tech firm in Idaho. 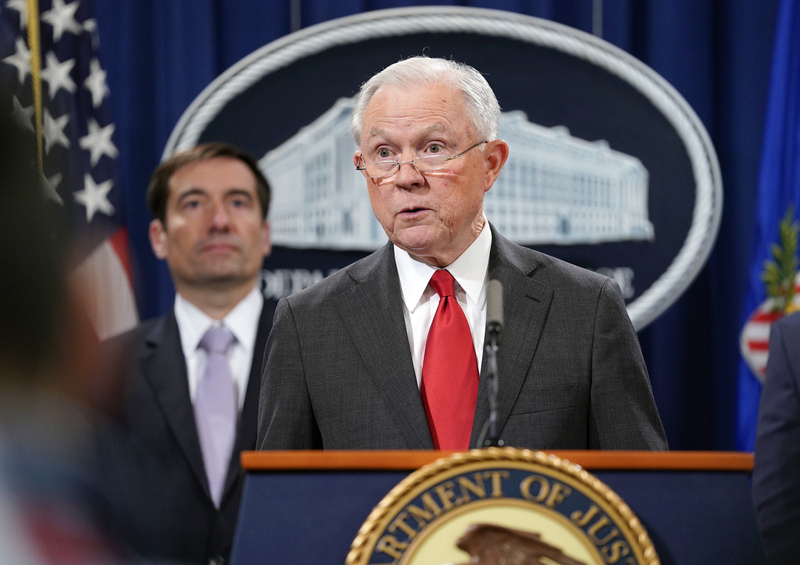 Along with the indictment, which was unsealed in the U.S. District Court for the Northern District of California, Attorney General Jeff Sessions announced the creation of a new working group aimed at prosecuting and protecting against Chinese efforts to lift economic secrets from U.S. companies. According to the indictment, Taiwanese firm United Microelectronics Corporation (UMC) partnered with Fujian Jinhua Integrated Circuit, which is owned by the Chinese state, in January 2016 with the goal of developing and producing dynamic random access memory, an electronic memory-storage device otherwise known as DRAM. Instead of developing the technology from scratch, however, the companies allegedly enlisted the help of three Taiwanese people who worked at the Taiwan arm of Micron Technology, an Idaho-based tech company that holds between 20 and 25 percent of the world market for DRAM, according to the indictment. The three Taiwanese men all resigned from their jobs at Micron Technology’s Taiwanese subsidiary between July 2015 and April 2016 and went to work at UMC. First to jump ship was Chen Zhengkun in July 2015, followed by He Jianting, who left Micron in October 2015 and started working for UMC that November. When Jianting left Micron, he took with him “confidential and proprietary materials” about the company’s DRAM technology, according to today’s indictment. A few months later Wang Yungming made the same move. Prosecutors say he uploaded more than 900 Micron files to Google Drive or storing them on a USB and bringing them to his new position with UMC. UMC and Fujian Jinhua began filing patents for DRAM technology starting in September 2016, using information that “could not be obtained through reverse engineering” Micron’s products, according to the indictment. When Taiwanese authorities raided UMC’s offices, as well as the homes of Jianting and Yungming in February 2017, they discovered records that contained Micron’s trade secrets. One employee at UMC also told Ho and Wang to hide devices that held trade secrets before the raid, according to the indictment. If convicted of charges of economic espionage and theft of trade secrets, the men face 25 years in prison and a $5 million fine. Meanwhile, the two companies could face forfeiture and a fine of more than $20 billion, according to a Justice Department press release. The Justice Department paired its criminal action Thursday with a civil lawsuit, seeking an injunction to prevent the companies from selling in the United States any product that includes technology pilfered from Micron. Micron has also filed a civil suit against UMC and Jinhua in the U.S. District Court for the Northern District of California. The new task force the Justice Department announced Thursday consists of five U.S. attorneys and will focus on highlighting “priority” cases involving the theft of trade secrets, targeting unregistered Chinese agents in the United States and increasing resources for U.S. attorneys across the country. In a statement, Micron senior vice president Joel Poppen praised the Justice Department for taking action against its former employees.